Here's a brief example of how the barebones Hooper-Bacal form can be used for a receptionist. Of course it's incomplete, so one would add additional tasks to use it in "real life". 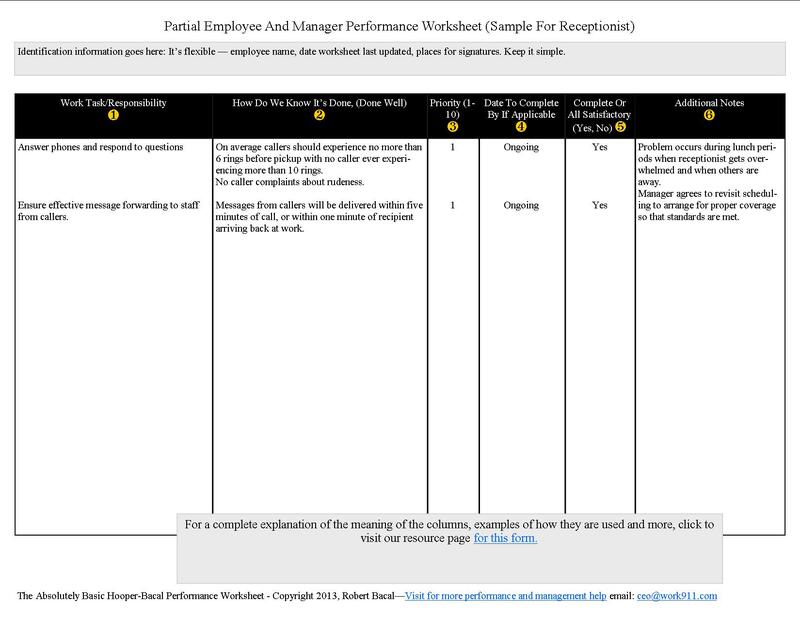 The worksheet has been used to communicate clearly with the receptionist what his or her main job tasks are, and it's also been used in a performance appraisal. We've only added a few job tasks, and probably, out in the real world, there would be three or four additional tasks that might have to do with filing, greeting in person, etc. In this case we've listed two major responsibilities, answering the phone, and also ensuring that messages get to the rest of staff promptly. Pretty standard stuff. These are really standards of performance that tell the staffer what constitutes a "good job". In this case they are measurable, but they don't have to be, since it's not possible to measure things quite so easily. In this case the EMPLOYEE AND MANAGER set the standards about what's reasonable. While it would be possible to measure these criteria, in practice, the cost and effort required to do so may not be justified. In fact, that's one problem with focusing only on measurables. Often the cost of measuring is too high, and actually gets in the way of job performance. Both tasks here are top priority. If we added additional job tasks to the form it would be important to NOT have them of equal priority. Assigning priority is to help staff allocate their time and balance demands, so if everything is top priority it gets useless. SInce both listed job tasks are ongoing, that's what goes here. Pretty easy. When should deliverables be due -- deadlines, IF IT'S APPROPRIATE to include them. Column 5: This is used during the "performance review". SImple yes or no. Was it done? Here we've done something interesting to demonstrate how flexible the format is. During the performance review at the end of the year, or at any time during the year, when manager and employee communicate about how things are going, notes can be made. In this case, during the year, a barrier to performance was identified. The receptionist had difficulty meeting the standards in Column 2 but only during lunch breaks. Having identified the barrier together, the manager realized he could and had to remove that barrier, and wrote down his commitment to do so, by setting up better coverage during the lunch break. This is a great example of how the manager's job is to remove barriers to performance.